Holiday Cards - Available NOW!! InterFaith Health Clinic invites you to share the joyous spirit of the holiday season by partnering with us in our holiday card program. The holidays are a time for us to remember friends, colleagues, and loved ones and to share the blessings of the holiday season. We invite you to share our message of health and hope by sending holiday greeting cards to those on your gift list this year, with all the proceeds underwriting direct patient care for the underserved in our community. To participate in our holiday card program this year, complete the form below and we'll handle the rest! Please make sure you list a complete mailing address for each honoree, as we're unable to look up mailing addresses due to the volume of cards we send out. If you would prefer, you may also download our holiday card donation form and mail it with your donation to the clinic. 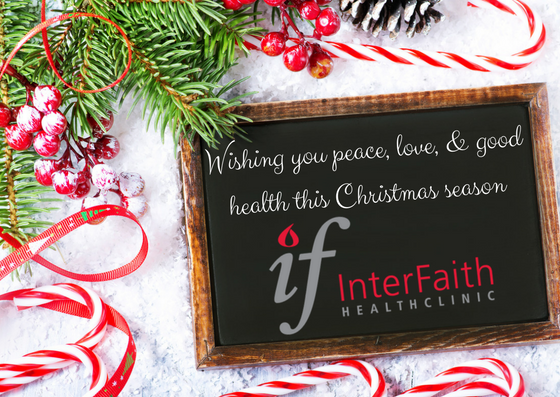 If you have questions about InterFaith's holiday card program, please contact Trudy Bledsoe at tbledsoe@interfaithhealthclinic.org or 865-243-3038.